High-temperature performance at low air pressures. 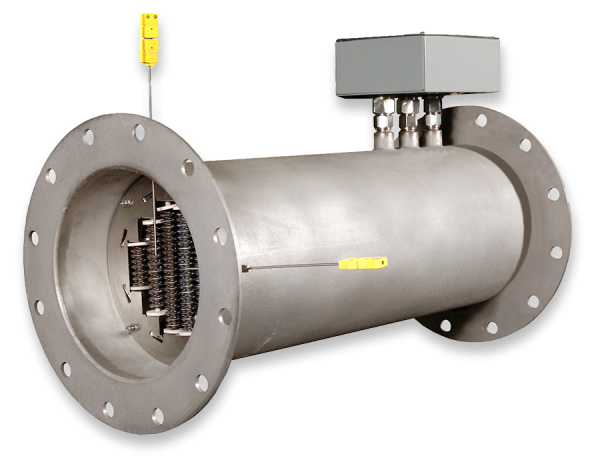 Inline Duct Heaters provide ultra-compact, fast response heating for a multitude of industrial and research applications where gas pressure is ≤ 10 PSI. Tutco SureHeat's proprietary Serpentine heating elements deliver the industry's highest watt density ensuring a compact installation, low weight, and fast ramp and response time. Factory preassembled with flanged connections and a round, heavy duty duct housing assures a quick, uncomplicated installation. A complete system includes a power supply control panel assuring safe, reliable operations.